Whilst having a pixel-based video output on TPU is great, there is fundamental limitations with regard to resolutions and memory. It’s very hard to convey real information with such a resolution, and really what I need is the old style text modes of past. Think 80×25 characters, DOS/BIOS post screens. What is needed to implement that sort of output? First of all, we need to fix down on our ‘text resolutions’. That is, the number of columns/rows, and the size in pixels of the glyphs we will draw. For this, I’m going to continue with 80 columns by 25 rows. 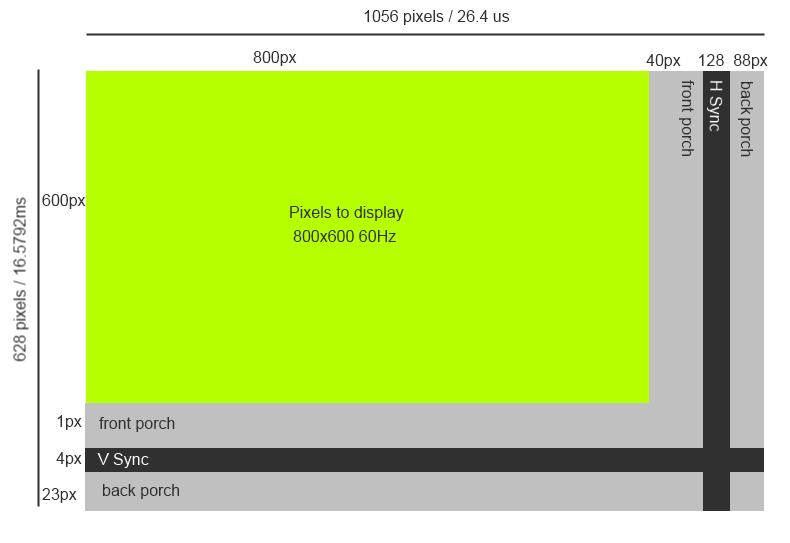 This means, if our glyphs are 8×16 pixels, a screen resolution of 640×400 is needed. That fits nicely into 640×480, if you don’t mind a border on the bottom edge – 640x400x70Hz is an option too. In addition to this, I want to be able to set colours for the text – foreground and background. I’d also want to make blinking of specific characters possible. The areas of memory where the ASCII characters to render are stored is called TRAM in my design, standing for text ram (not to be confused with the .text executable sections in binaries!). For each character tile on our 80×25 character grid, we will have two bytes – the ASCII character, along with an attribute byte. This attribute byte will define the foreground and background colours for this glyph tile – along with whether or not the tile should be blinking. 80×25 2-byte characters comes out as 4,000 bytes. That will nearly fill two 2KB Xilinx block rams. I could have used 80×30, perfectly filling the whole 640×480 screen resolution, but I couldn’t bring myself to add that third block ram. Despite that, we do have plenty of them available on the miniSpartan6+ board. My LX25 variant has 52 available, for a total of 104KB storage. These block rams are integrated into my top-level TPU design in the same way as the existing VRAM, so they are both readable and writable by TPU, and readable (at a differing clock rate) for use by our new VHDL module which will generate the pixel stream required to represent our text characters. 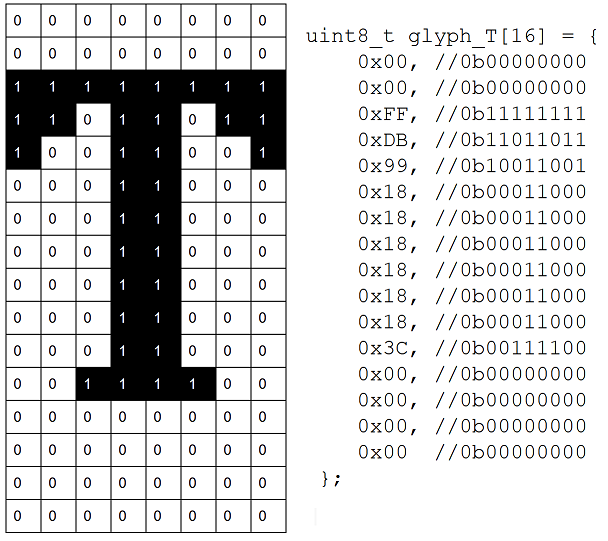 The glyphs themselves are stored as 16 bytes, with 1 bit corresponding to a pixel in the output. A 1 value indicates foreground shading, whilst 0 is unsurprisingly background. With the glyphs organized linearly as a packed array of 16-byte elements, for the full 256 range of characters, we’ll need exactly two 2KB block rams. This storage could also be implemented as a ROM, but I’m going to go ahead and use the same module I use or the text ram (and VRAM) so that the user can edit the storage to implement custom glyphs. In the last part, I introduced a VGA signal generator. This module takes a pixel clock, and generates sync, blanking and an x and y coordinate for the pixel that is being output. This X and Y information is used to generate a memory address, at which VRAM contains the 16-bit 565 colour to output for that pixel. The RGB value then goes to encoders, and serialized out as DVI-D.
With this signal generator, we will first change the timings to output a 640x480x60Hz set of signals. 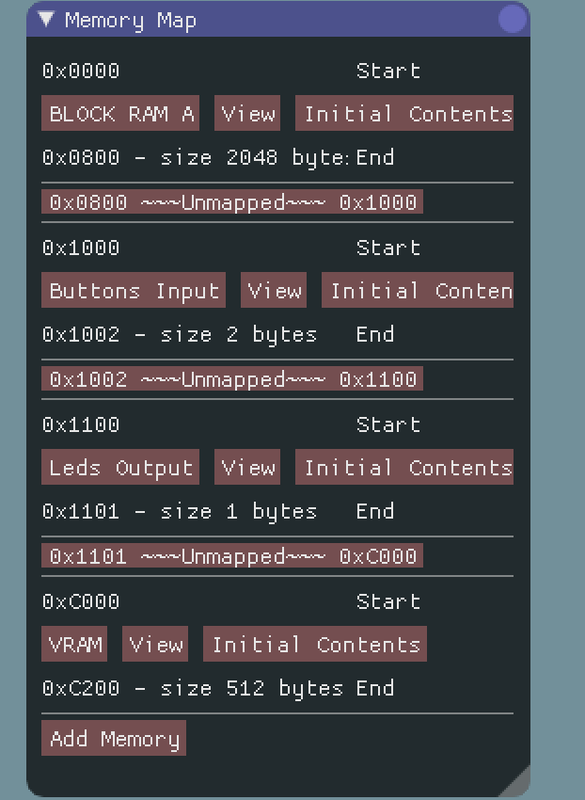 The x and Y output will no longer form an address into vram, but will be passed into a text_gen module. This new module, for a given X and Y, will generate addresses into the text and font rams, manage the operation of the data from those rams, and eventually output a pixel value. This text_gen module needs to operate at a faster clock, as for any pixel, there could be two dependent memory reads issued which need serviced before output is provided. For each pixel value, the 8×16 text ’tile’ index is calculated. From this, the location in tram is known – a basic tile_y*80+tile_x calculation. In the VHDL, we use the unsigned type which has the multiplication operation defined. This synthesizes to a DSP48A1. There are timing considerations here that I need to take into account – more on that later. The 16-bit data word from TRAM is captured after several cycles of latency. This data is latched within text_gen, and the ASCII character code part of this used to calculate a further address into the font ram. This calculation is easier due to the 16-byte layout, so can be implemented with shifts. After a further few cycles of latency to allow the external memory to respond, we get a single byte equating to a row within the glyph. Using out input X pixel coordinate, we look up the relevant bit in the glyph row – which is then used to select a foreground or background colour. The colours themselves are selected using the other byte obtained from text ram – the attribute byte. The attribute byte layout is the same as other text modes. A single blink bit, 3 bits of background colour and 4 bits of foreground. These could be interpreted in other ways (for example disabling blinking can allow for more background colours) but at the moment they simply index into one of 8 available background colours or 16 available foreground colours. 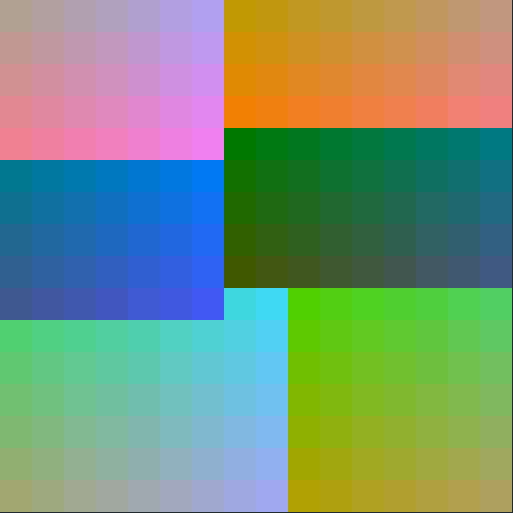 I’ve fixed the colours themselves but there is no reason as to why these colours could not be memory mapped so that the palette can be changed programmatically. Blinking is achieved by checking an internal counter, along with the blink attribute bit. If the blink bit is set, and the counter is in a non-blink state, the background color is chosen regardless of the glyph properties. I have the text generator currently running at 10x pixel clock. This is probably being too safe, and I could bring it down to 5x. I’ll have to check the timing constraints more thoroughly. The module assumes the rows are scanned across the rows just like VGA. Each time a pixel X offset is input which we know is the start of a new glyph, a 2-byte TRAM fetch is initiated. 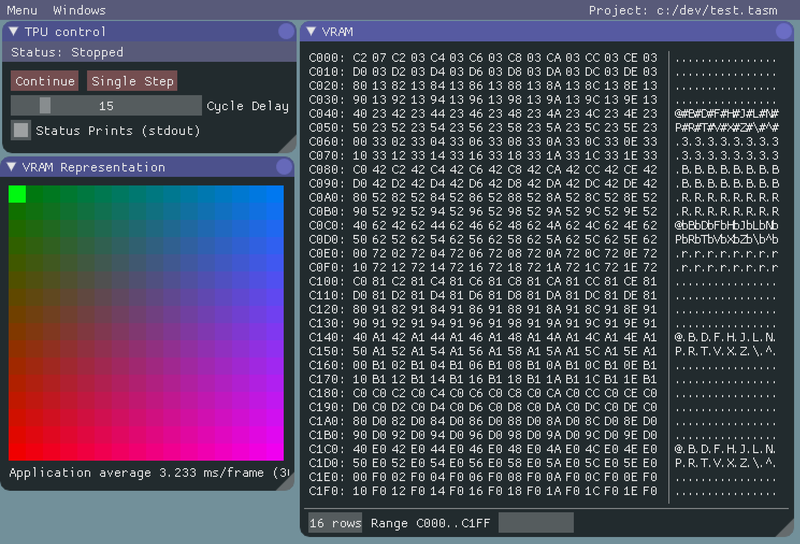 The result of that fetch is used to latch colours from the attribute byte, and then fetch a 1-byte glyph row. That row is latched, and used by the next 8 pixels which are input to the generator. The states are short-circuited to the last stage. I’ve attached full source of the module below. The first run of the text_gen module was actually very successful. I initialized the text block rams with some characters, and used a font ROM that I found which implemented an ASCII character set. The display worked, albeit with characters in the wrong place. The character I expected to be at position 0,0 was actually in 2,0. I think there is an issue with timing in terms of how much latency the DSP48 slice needs to perform the multiplication required for calculating the TRAM location. One of the things that I needed to do from the previous part is that we need the next pixel locations to be used, rather than the current pixel which is what is used now. To get around this, I implemented a simple FIFO in the VGA signal generator. The length of the FIFO can be changed, and the module now outputs a set of signals for the current pixel, which is sent to the TMDS encoders, as well as a set of prefetch signals, which are currently 8 pixels early. These prefetch signals are sent to the text_gen and allow for plenty of time for memory and other latencies to be accounted for. With this change, the output was correct. The expected character in 0,0 was rendered at that location. Another issue was that the colour of any character was incorrect. For example, the character at position 2,0 had the colour of character 1,0. Moving around the point where the attribute byte and colours were latched in the state machine fixed this. 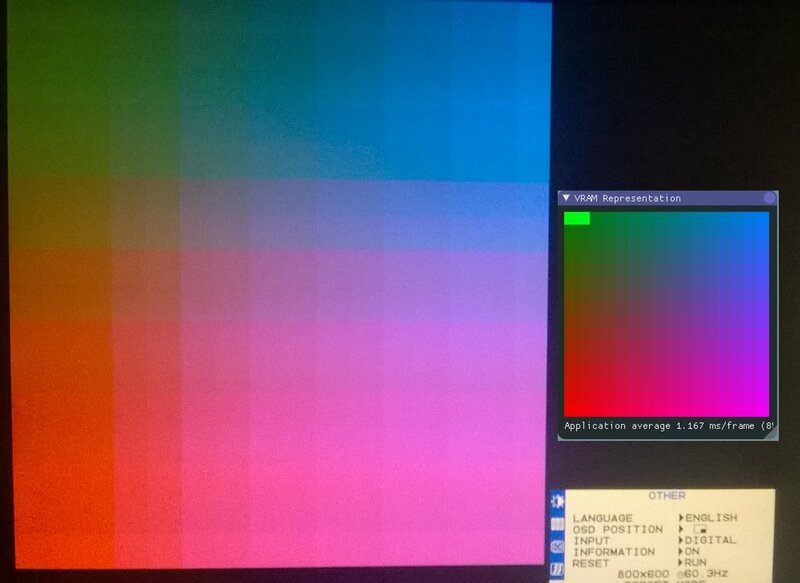 I had been doing lots of asynchronous operations, but performing a latching operation on the RGB pixel data made it much more stable. So text mode works, fairly well. This was a lot easier to get working than I thought it would. I hope to get a small demo together where input from the UART is echoed to this command prompt, and get some simple test commands working. --   or background colour to display for a given pizel in an 8x16 glyph. --   locations are inputted early to the text_gen so data can be prefetched. 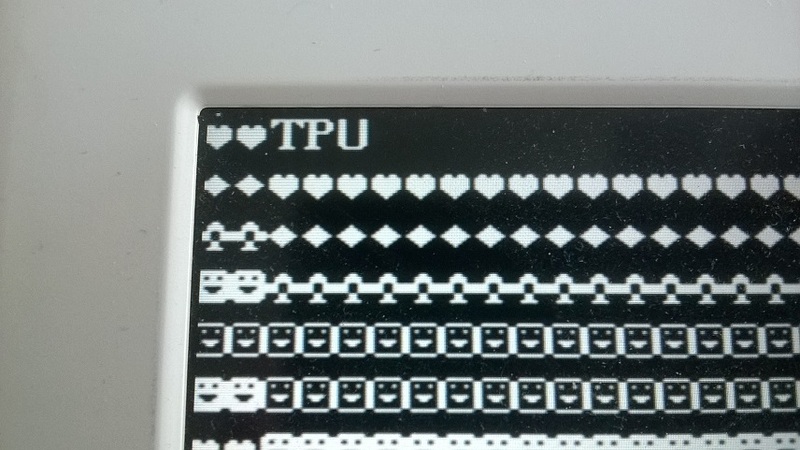 I’ve been working towards HDMI output on my TPU SOC, and this week I managed to get enough of something to get pixels (very large pixels!) output to the screen. 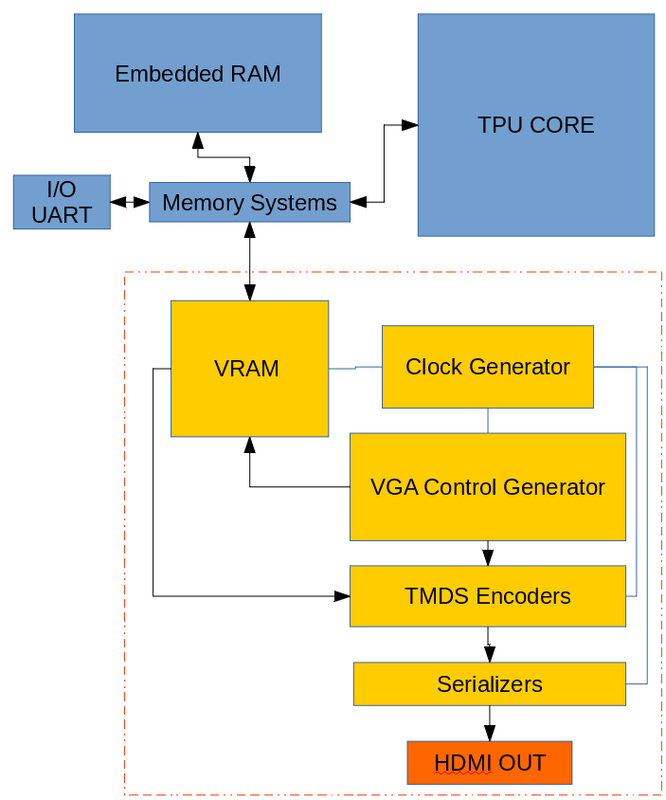 The plan was to map an area of memory to a VRAM block, which could be read and written to form the TPU, and also read for the graphics subsystem that would generate the video signals that are to be output. The current ram used in TPU is a block ram primitive entity on Spartan6 – RAMB16BWER. This 16Kbit ram has two ports, which can be run at different clock rates. At the moment, we map this primitive into an ‘ebram’ component, which disables the second port, and services the block ram via the bus signals on TPU. I made a new component, handily named ‘ebram2port’ to expose the second port of the RAMB16BWER instance for read-only use. An instance of eram2port is created in my TPU top-level design. The chip select signals (I_cs and I_p2_cs) are driven via some conditionals which check for address ranges on the TPU output bus. 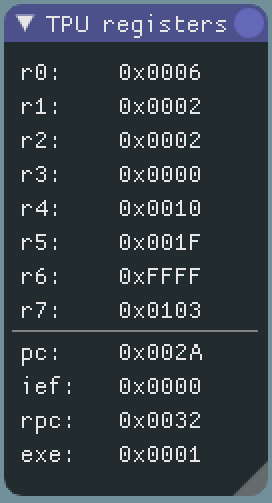 CS_ERAM being the chip select for the actual embedded ram instance, with the TPU bootloader code. The input to TPU from our data sources, such as RAM and peripherals, also needs to change. INT_DATA and IO_DATA busses are controlled by other external processes, and thus don’t matter much here. This code is what I’d like auto-generated from my emulator, temu – as it’s the sort of code which when duplicated to the extent I’ll need (for tens of block rams integrated) that human error comes into play. Everyone makes copy and paste errors. Everyone. The last real item is the address, which is fed into I_addr. This must be modified from the 0xc000 – 0xc200 address that TPU sees to 0x0000 – 0x0200. This is done as you’d expect, by simply chopping off the high 4 bits. Now we have a VRAM block integrated into the TPU top-level module, which TPU programs can read and write to via standard memory instructions to our mapped area of memory, but which also has a second port, which can read the same memory but at a different clock rate. The difference in clock rate is the important part in this. DVI is a subset of HDMI. The pixel signals and timing is essentially the same as VGA. The data is encoded as TMDS serial. The data is then sent along 3 differential signal pairs, with a 4th pair for a clock. 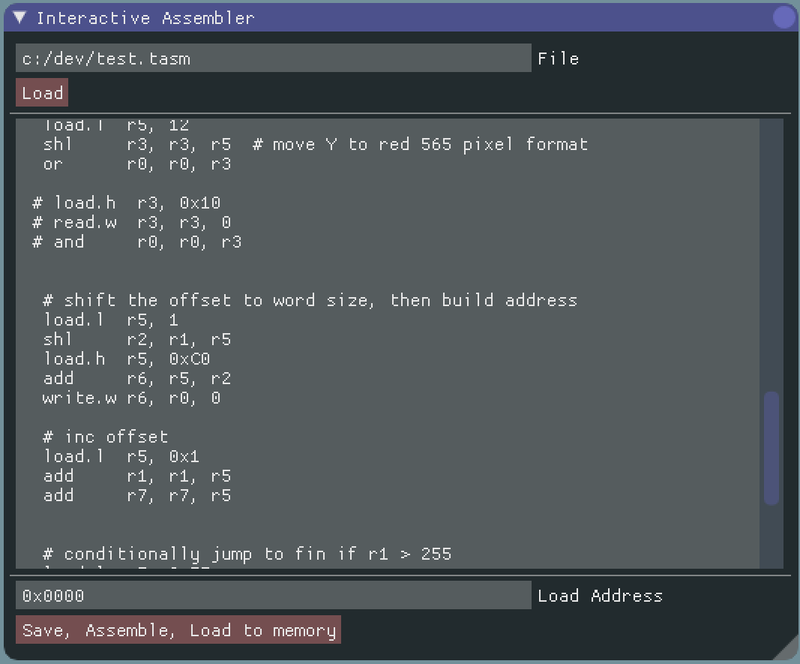 My code uses the DVID test project from Michaels Hamsterworks Wiki. I’ve edited some areas of the code, for my own requirements. VGA timing generally works along the lines of a pixel clock, which is set specifically to allow for the number of pixels required for your resolution to be transmitted within tolerances, along with horizontal and vertical sync signals, and a blanking flag. The pixel data itself can be thought of as a sub-image of a larger set of data which is transmitted, origin in the top left hand corner. The area to the right and bottom which is not part of the original data is ‘blank’. The timings and the durations of these blanking periods all depends on set figures defined by standards. For example, for an 800×600, 60Hz image, the pixel clock is 40MHz. Essentially, each row can be thought of as having around 1056 pixels, with the additional pixels accounting for blanking and sync periods, where the actual pixel value doesn’t matter – it exists only for timing. An example for the resolution above lays out the exact number of pixels in each are, along with time representations. The VGA signal generator is exposed in my TPU design as the following entity. 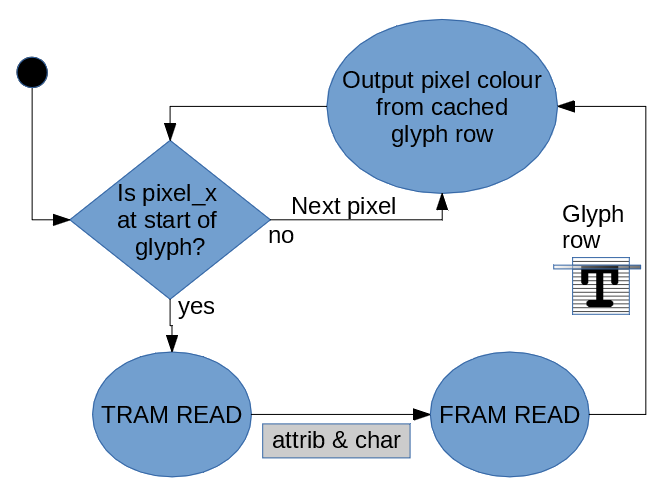 The pixel_h and pixel_v offsets then combine to form an address which can be looked up in VRAM, which holds the pixel data. The actual image data we’ll send over the HDMI cable is actually DVI. The Way HDMI and DVI send image data can be pretty much the same. HDMI can carry more varied data, such as sound – but thats really just hidden in the blanking periods of the communicated image. TMDS (or Transition-minimized differential signalling if you want the full name!) is a method for transmitting serial data at high clock rates over varying length cables. It has methods for reducing the effects of electromagnetic interference. You can read more about it over at Wikipedia. The main understanding required is that it’s a form of 8b/10b encoding. 8 bits of data are encoded as 10 bits in such a way that the number of transitions to 1 or 0 states are balanced. This allows the DC voltage to be at a sustained average level – which has various benefits. A two-stage process converts an input of 8 bits into a 10 bit code. In the first stage, the first bit is transformed and each subsequent bit is either XOR or XNOR transformed against the previous bit. The encoder chooses between XOR and XNOR by determining which will result in the fewest transitions. The ninth bit encodes which operation was used. In the second stage, the first eight bits are optionally inverted to even out the balance of ones and zeros and therefore the sustained average DC level; the tenth bit encodes whether this inversion took place. With this encoder, we can get the 10 bits we then need to serialize across the cable to our monitor. To serialize the TMDS data to our differential output pairs, we use Double Data rate Registers (ODDR2). These registers are implemented as primitives in the VHDL. Using these DDR registers, we only need a serialization clock 5x that of the pixel clock, rather than 10x. There are ‘true’ serialization primitives available on Spartan6, which I may look at later (there is a SERDES example on Hamsterworks for those interested). Each pixel clock, the 10-bit TMDS value for each pixel is latched. Each subsequent cycle of the 5x pixel clock, the TMDS value is shifted 2 bits to the right. The low 2 bits are then fed into the D0 and D1 inputs of our DDR2 register. 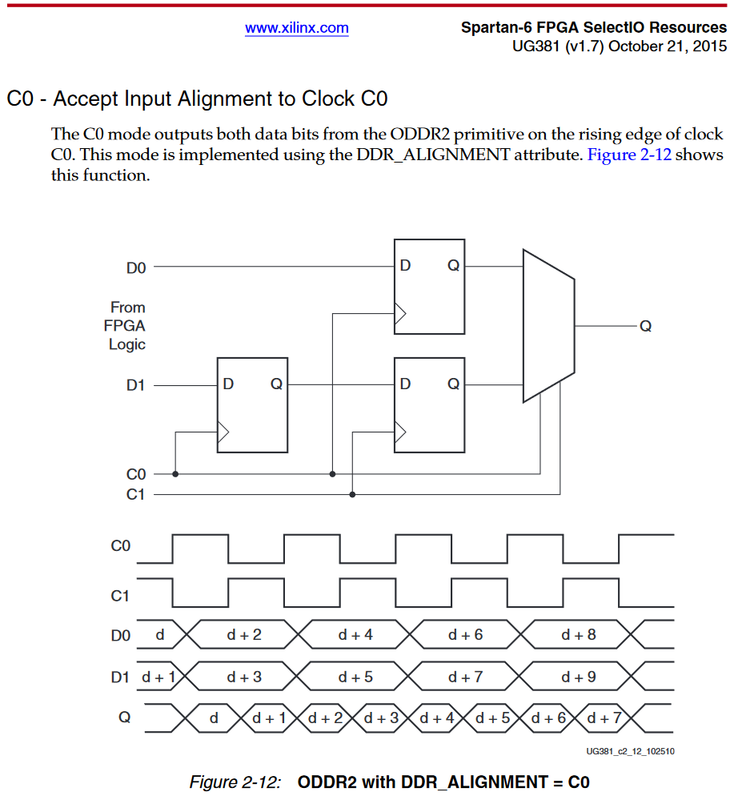 The clock inputs C0 and C1 are both 5x pixel, so 200MHz, but the C1 clock input is 180 degrees out of phase. 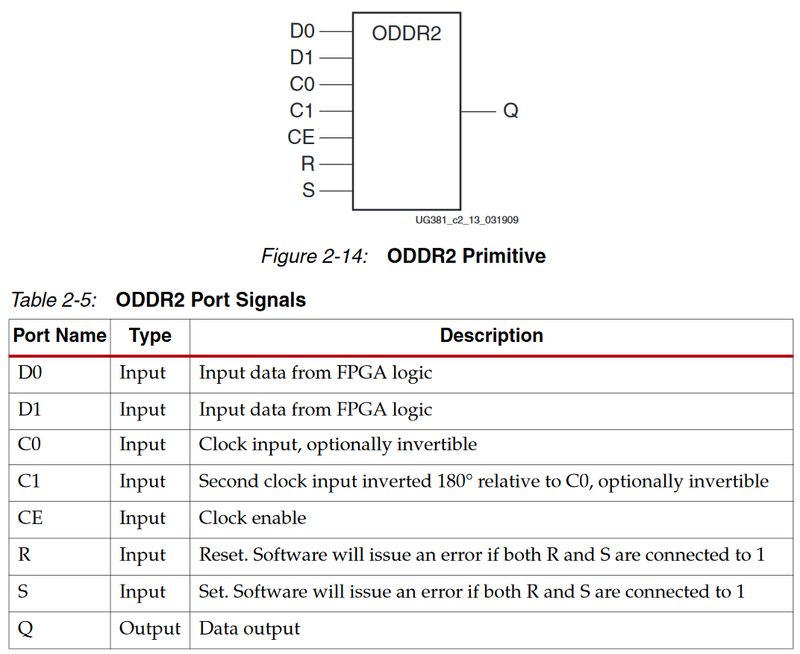 The output of this register, red_s, is then fed into an OBUFDS primitive which drives the TMDS pair output, which is connected to the HDMI socket pins on the miniSpartan6+ board. There is similar for the other 3 channels. It goes in the order 0:Blue, 1:Green, 2:Red, 3:Clock. At the moment my clocking system needs work, but it’s fixed just now to my needs for 800x600x60Hz. For this, the 50MHz miniSpartan6+ input clock is buffered, then input into a PLL which multiplies it by 20 to 800MHz, before dividing it to 40MHz for the pixel clock, and 200MHz for the serial drivers. There is also a second 200MHz output, 180 degrees out of phase, used in the ODDR registers as clk_n. As with the 50MHz input, the 3 clock outputs are buffered before being used in the various subsystems. For this the BUFG primitive is used. The ‘VRAM’ is currently set up to contain a 16×16 image. Tiny, but perfect for what I need just now. The 16-bit pixels are in 565 format, and I trivially expand that to 8-bit for the TMDS encoders. Now we have an integrated graphics subsystem, albeit one that is very rigid (for now). Without it, the VHDL doesn’t route. It compiles and works fine (seemingly) with that included, but I’ve still to nail down exactly what it means, an how to fix it. Currently, my understanding is that when my VHDL is built, the compilers can’t generate clock placement which satisfies all the rules set. It’s something I want to understand further. It could be as simple as missing out some buffers. 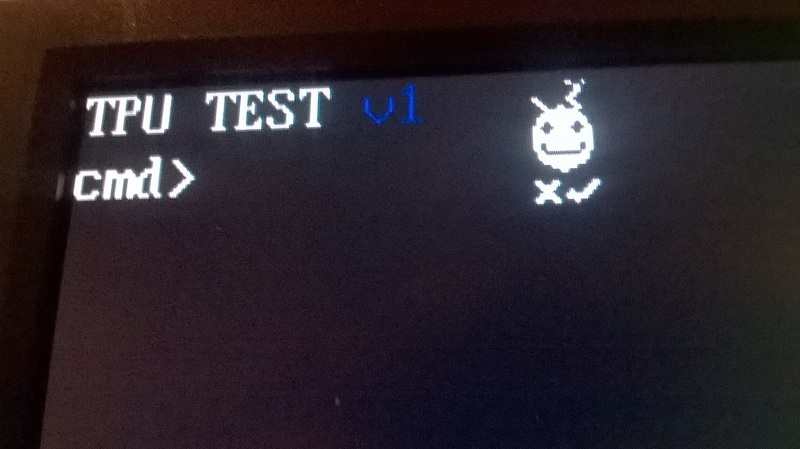 There is also a line of pixels to the far right of the displayed screen, which suggests I’m out of phase by one pixel with the memory read results and the VGA signals. 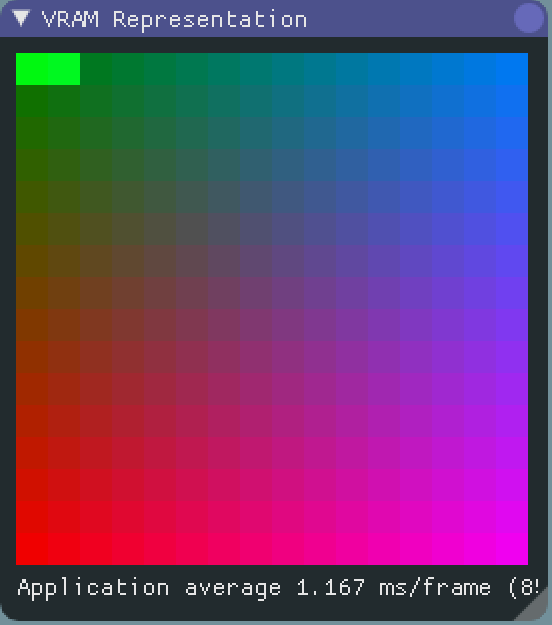 This isn’t too bad, so I’ll look at fixing that along when I increase the VRAM size for higher resolution. This brings this part to a close. We have HDMI output which is the representation of a small VRAM that TPU controls. It’s pretty neat. I hope to increase the resolution of the image from it’s current 16×16 to something more manageable. Thanks for reading, as always let me know your thoughts via twitter @domipheus. Also, many thanks to Michael Field and his DVID project of which the bulk of this post is derived from.